This is universal cargo roof rack, which is ideal for cars and SUVs. It is made from sturdy aluminum alloy and solid plastic with black finish. It can be used with other roof accessories, like bike rack, snowboard, roof racks etc. The roof rack comes with everything you need and mounting accessories. It is completely removable. The roof rack is easy to install and requires no tools. Save more space in your vehicle for more passengers on your road trips. Lightweight But Sturdy Frame: The aluminum alloy frame matches the durability with a lightweight feel so that it is easy to transfer and rig to your car, without adding even more unnecessary weight. 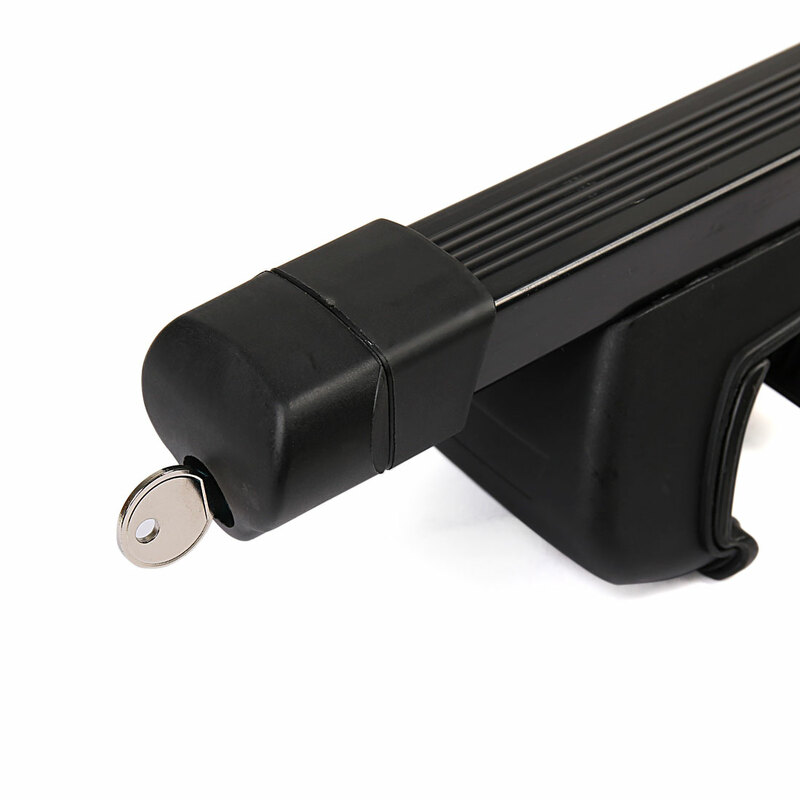 Anti-Theft Security Locking System Design: Each clamp has its own built-in lock and key. Knobs are key lockable as a theft deterrent measure. Lockable for security added to each bar for additional cargo protection. Adjustable Width To Fit Different Vehicles With Rails: Self-adaptive base feet allow angle adjustment to fit car roof arc perfectly. Just simply slide the base foot to suitable car rails width and lock. Easy To Assemble And Easy To Install: Its very easy to install and it can be set put on or take off in minutes. Allow users of an automobile to transport objects on the roof of the vehicle without reducing interior space for occupants, or the cargo area volume limits such as in the typical car's trunk design. Mounting accessories included. No drilling required. Suit For Most Cars And Trucks: Universally fits most vehicles with raised side rails (there is a gap between rail and roof). Ideal for use with cars, trucks, SUVs and minivans. Insert the key and pull out the end. Turn the lock assembly counterclockwise to release the lock on the lever. Push in the end. Place the crossbar onto your car. Turn the lock clockwise to tighten the clamp on the crossbar. Check if there is any movement. Use the key to lock the roof rack in place.